You are here: Home / Fan Club / -Join Up! A monthly email newsletter containing Summer’s tips, links and more! A special, members-only link to a downloadable, full-page PDF calendarÂ â€” new each month! 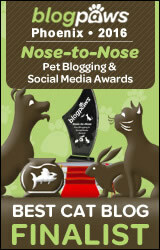 Coupons and special promotions from many popular pet-related online merchants! 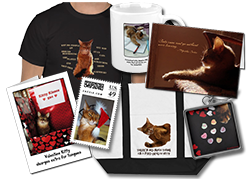 Fan Club-only contestsÂ â€” win copies of Sparkle’s books and Summer’s calendars, cat toys and other exciting prizes! A special Fan Club banner you can add to your blog or website! And lots more cool cat stuff! 1. I pledge my allegiance and loyalty to all felines around the world… and beyond. 2. I affirm that cats are superior to the human race, and that humans were put on this earth to serve cats. 3. I shall groom frequently, so I am always clean and presentable. 4. I shall play hard, nap hard and purr frequently. 5. I will always lend a helping hand to a cat or kitten less fortunate than myself. 6. I will show my clawsÂ â€” and use themÂ â€” when someone is being cruel to another cat. 7. When a human is neglectful of his or her duties (i.e., changing the litter box, purchasing quality cat food, supplying sufficient cat toys, etc. ), I shall make this fact known in no uncertain terms. 8. If I am a human, I will make sure my cats have pristine litter boxes, the highest quality premium cat food and an array of cat toys so they don’t get bored. If I am neglectful in any of these aforementioned responsibilities, I will not complain when I receive the appropriate consequences. 9. I will do all in my power to rid the world of kill shelters, and to strive for all cats to find homes where they are loved, appreciated and served. 10. I shall always behave with dignity, and expect the respect I deserve.